Several field trips are planned in conjunction with the 16th North American Mine Ventilation Symposium. The trips are available to all Symposium attendees, although space is limited and an additional fee for each trip will be required. All trips will take place on Thursday, June 22, 2017, so it will not be possible for an attendee to participate in more than one trip. All trip participants must wear long sleeved shirts and long pants (no shorts). Closed toe shoes are required. All necessary personal protective equipment (PPE) will be provided to each participant. Please note that trip details may change prior to the field trip date. Updates will be posted on this website. The mountains above Idaho Springs and the nearby communities of Black Hawk, Central City and Georgetown show the abandoned mine openings and remnants of a romantic past: the "Rush to the Rockies" and feverish mining for silver and gold. The Henderson Mill is located on the west side of the Continental Divide, fifteen miles from the mine in Grand County. The Mine and the Mill are connected by the world's longest conveyor of its kind; a fifteen-mile elevated belt that passes underneath the Continental Divide through an old train tunnel and then above ground to the Mill. 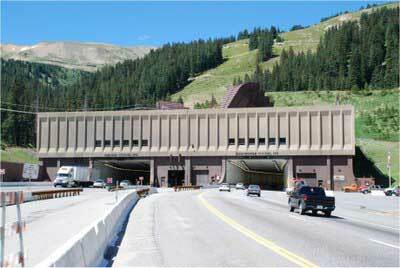 The Eisenhower/Johnson Memorial Tunnel is located in the Colorado Department of Transportation's Region 1, in Maintenance Section 9, and facilitates movement of people, and goods from the Eastern Slope of the Rocky Mountains to the Western Slope. The Eisenhower/Johnson Memorial Tunnels are located approximately sixty miles west of Denver, Colorado on Interstate 70, and are a part of the Colorado Department of Transportation. We are one of nine Maintenance and Operations Sections dedicated to developing and maintaining the best possible multi modal transportation system for Colorado that most effectively moves people, goods and information. March 8, 2013, marked the 40th anniversary of the dedication and opening of the westbound bore or the Eisenhower Tunnel at the Eisenhower/Johnson Memorial Tunnel west of Denver, which is the highest vehicle tunnel in the world at 11,155 feet. The Eisenhower Tunnel was the first of two bores to open to help facilitate easier transportation between Colorado's east and west slopes.